A weekly spreadsheet summarizing the latest valuations of all companies in the ModernGraham Universe. Market Overview - Aggregate data on all companies in the the MG Universe, and analysis of both the Dow Jones Industrial Average and the S&P 500 indices. Watch List - Copy/Paste your favorite tickers into the watch list to bring up the ModernGraham data on them. Latest Updates - List of the latest individual company valuations by ModernGraham. 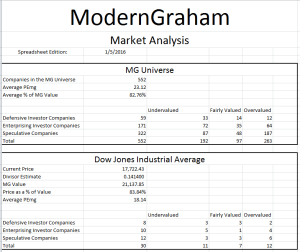 MG Universe - Sortable table listing all companies in the MG Universe and the ModernGraham data on them. Dow Jones Industrial Average - Sortable table listing the components of the Dow Jones Industrial Average and the ModernGraham data on them. S&P 500 - Sortable table listing the components of the S&P 500 Index and the ModernGraham data on them. Valuation Calculator - Calculator for you to plug in data for companies not covered by ModernGraham. Get it with the Adviser / Fund Manager Bundle Instead! Get a FREE 7-day trial! Cancellation and Refunds: If you are unhappy with your subscription for any reason, please send an email to ben@moderngraham.com to cancel. If immediate cancellation is requested, a pro-rated refund of the most recent subscription fee will be issued. If you would like to simply cancel at the end of your current billing cycle, the recurring payment will be stopped.